What gives stately homes their character? Why do elegant rooms feel so inviting? What's the best way to enhance the ambience of your favourite household space? Here at Elite Mouldings we've got answers to these questions, and they come in the form of the world's finest trim, moulding, and wainscot. We use these elements to infuse today's homes with the kind of grace, elegance and refinement that's easy to love. We do our work in ways that never go out of style, and we succeed by combining three things that few other firms even attempt to match. There are faster and easier ways to make money in the trim business, but we think our results are worth the extra effort. Our customers think so, too. Read their own words to see for yourself. What's not so apparent from these comments is how we make it all happen. To tell you the truth, we enjoy an almost unfair competitive advantage when it comes to what we do. Our team of resident designers and craftsmen love their work. This is our secret. It's at the heart of our corporate DNA. It gives us the energy to monitor the world of architectural detailing with enthusiasm, bringing the best of new designs and materials to discerning clients. 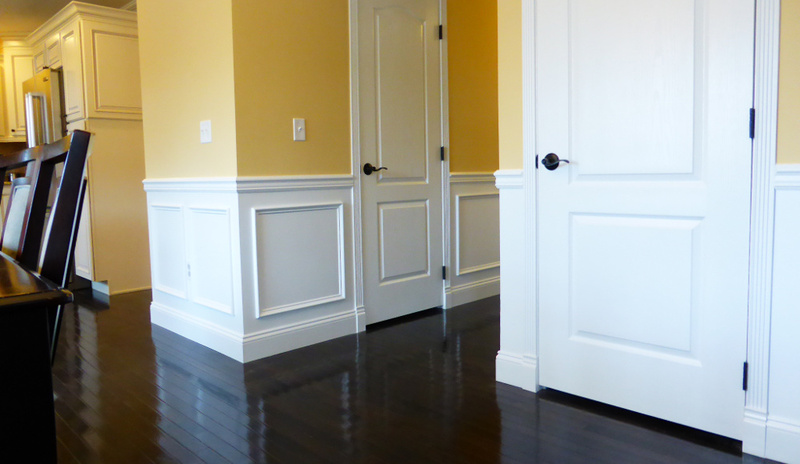 Nowhere else but at Elite will you find our flexible, paintable wainscoting that arcs effortlessly around curved walls. You won't find our hardwood-veneered raised panel wainscoting anywhere else, either. Then there are the 40 different kinds of embossed architectural mouldings that we developed based on European technology -- another Elite Moulding exclusive. Corbels, columns, ceiling medallions, beamed ceilings . . . the list is long. In fact, our intimate knowledge of all the options allows us to confidently offer thousands of the finest, most advanced architectural enhancements available today. You have to feel sorry for homeowners who've never experienced this range of choice and beauty. Our website is a great place to begin learning how the Elite team can enhance your home, but there's more. If you're serious about making your home all that it can be, consider this your personal invitation. Come on out and visit us at our giant 5,000 sq. ft. showroom. Everywhere you look, you'll find something new to like. Elite Mouldings originated in 1999 with a 3,000 square feet and three employees. Throughout the years we have grown exponentially and taken a company that only made embossed cornice to one that offers one of the largest varieties of interior and exterior architectural products in Canada. From embossed cornice we ventured into a wainscoting line up which offered our clients a multitude of design options that can completely transform any room. Transforming a room is what our installation team does best which is why we offer this superior service to our Canadian customers. Our next goal was to offer our superior products to a wider range of customers. We started shipping all across North America. Our online store, Elitetrimworks.com was developed to better service our clients all over North America by providing them with extensive information on all our merchandise and allowing them to easily order online. We continued to flourish over the years and processed over 20,000 orders as a result of our online store. The next endeavor for Elite Mouldings was to begin selling columns, which was so successful we started to make our own. From interior and exterior columns we move onto bigger and better things. We created our own showroom to properly show our clients how stunning a space can become with the help of Elite Mouldings’ products. With an upgrade to 20,000 square feet we were able to begin selling a full line of interior and exterior doors, columns, mouldings and other architectural accents. From flexible mouldings to easily installed polyurethane products and other trimwork. We can summarize what we do as... jewelry for your home!